Kampot is the essence of why we fell in love with Cambodia. This sleepy provincial town could not be more removed from the hustle and bustle of hectic Phnom Penh. Instead of cars and motorcycles, here it seems virtually everyone travels by bicycle. 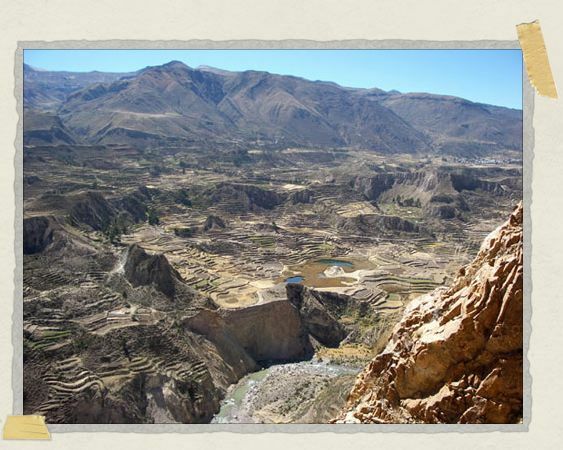 The city of Arequipa is the gateway to a place called Cañon del Colca, the second-deepest canyon in the world. (The deepest in the world is Cañon del Cotahuasi, a stone's throw to the north and only an eyelash or so deeper.) For only US$20 each, we booked ourselves an overnight trip to this canyon, and there we had coca tea at the roof of the world, saw plants that look and feel like stone, saw a church being eaten by the earth, walked along stone terracing over 1000 years old, and befriended an absolutely lovely couple named Paul and Caroline (no, not that Paul and Caroline, a new Paul and Caroline). In short, we had more experiences than I have the room to describe here, so I'll restrict myself to four of them. We stayed overnight in the little mountain village of Chivay, perched at the breathtaking altitude of 3700m (about 2.25 miles) above sea level. After checking in, we all assembled back at the bus for our evening trek. We were driven about fifteen minutes from town, and there we started hiking. Even though the two of us were fairly well acclimatized (to Arequpia's altitude of 2350m, anyway), it was an exhausting climb. We were ascending the mountain overlooking Chivay, and the higher we got, the more astonishing the view of the valley below us was. 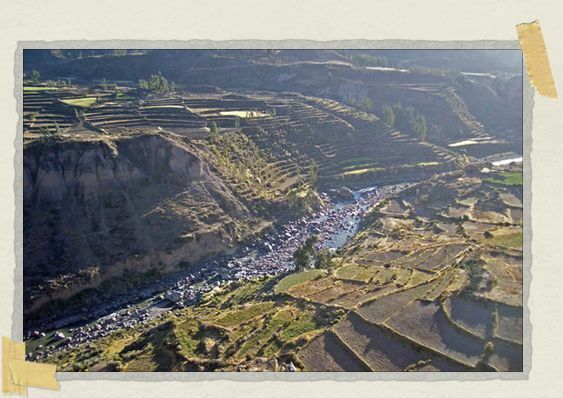 At a point about two-thirds of the way to the top, we stopped on a rocky ledge to hear the story of the two tribes that inhabited this canyon in the centuries before the arrival of the Incas. After catching our collective breath, we started back up the mountain. The cliff face we approached near the summit was pocketed with caves, all of them bricked up with pre-Incan masonry. As we got closer, we started seeing the bones. They were everywhere, nestled into every crevice, filling every deep hole, like something out of a horror movie. Most had been bleached white by centuries of sun, and they looked almost plastic, almost fake. Irene, our guide, made offerings of coca leaves and water before letting us approach. She showed us an opening that looked like nothing so much as a window. Three skulls were lined on the ledge, and in the dimly-lit chamber behind them we could make out an enormous pile of bones. This tomb, she told us, was over 1200 years old, and had lain here entirely intact until looters in the 1970s stole all of the jewelry the dead had been buried with. The bones they left, now piled and chaotic, still looking out at the valley they'd borne watch over for more than a millenium. After hiking up a mountain and back, especially at an altitude only a few hundred meters short of the higest point on the grueling Inca Trail, we were knackered. Blessedly, our next stop was the lovely thermal baths back in Chivay. These baths, an optional leg of the tour, had been enthusiastically recommended to us by our Irish friends Colin and Aoife, whom we had first met in Buenos Aires and then run into again in Arequipa. Jessica and I had never experienced hot springs before, and didn't quite know what to expect. There were two pools, one inside and one outside under the stars. Why you would choose the inside pool I couldn't tell you. 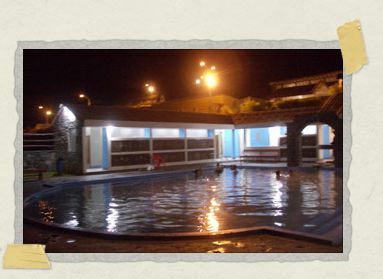 At such high altitude, it was an extrememly chilly evening, and steam was pouring off the outdoor pool in massive waves. The water in the pool was melted snow and rain runoff from up in the mountains, heated to over 80ºC (176ºF) by volcanic activity. Filled with minerals but otherwise absolutely pure and clean, it was cooled at the baths to a mere 38ºC (100ºF). And it was heavenly. I have never experienced anything I can compare to stepping into a steaming volcanic pool on a frigid mountain night. Our group was among the last to arrive at the baths, and we had them nearly to ourselves. It was the most relaxing, soothing thing I have ever felt. We stayed in that pool until the place closed for the night. 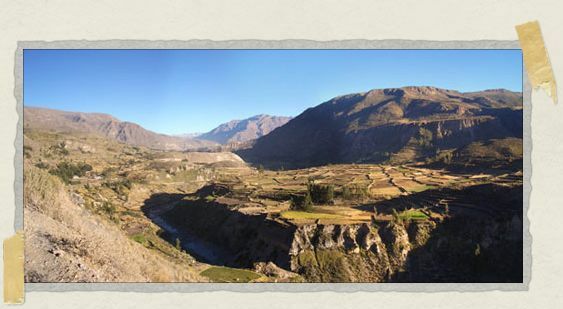 The highlight of any trip to Cañon del Colca is a visit to a site called Cruz del Cóndor, an abyss of a gully that is home to a large family of condors. Here you can watch the largest non-earthbound birds in the world gliding along thermal air currents, on the lookout for some tasty carrion in the valley below. The first of them swept past us on our way to the mirador (lookout). They soared by, right alongside us, birds measuring up to ten feet from wingtip to wingtip. I spent the first fifteen minutes or so repeating to myself, "They're so big. I mean, I knew they'd be big, but I had no idea..."
From the mirador, they were more spectacular still, soaring right over us, so close that you felt like you could reach up and touch them. They are such awe-inspring creatures. It is no surprise that they meant so much to the Incas. In Incan mythology, the Condor represents the sky, just as the Serpent represents the abyss and the Puma represents the earth. 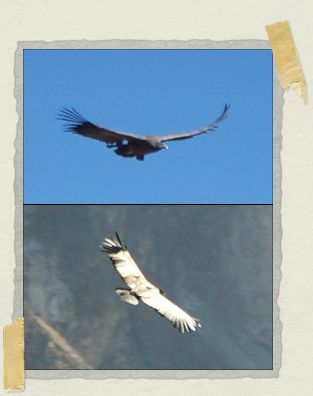 Condors are also closely tied with a defining moment in Ican history: a battle at a place called Sacsayhuamán. This was the last gasp of the Incas, and their defeat on the battlefield here ensured Spanish dominion over the Andes. 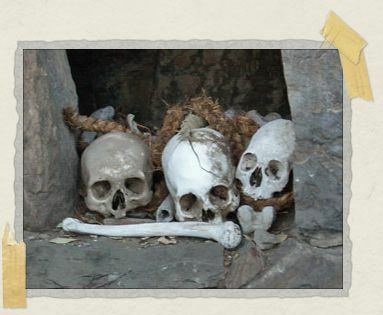 After the battle, the ground was littered with the bodies of thousands upon thousands of fallen Incas. Soon the air was filled with condors, wheeling and diving, devouring the bodies of the dead. In memory of this, eight condors were added to the coat of arms of Cuzco, the capital city of the Inca Empire. I second that – Wow! I think I must third that wow! Stunning pics! I swoon at the gorgeousness. And I can DITTO wholeheartedly on the hot springs having done so on many occasions myself. One particularly notable evening spent with red wine, a naturally occuring hot tub and a meteor shower. Heaven. Beautiful shots, Tim, and very evocative descriptions, too! We're heading to the Canyon tomorrow at 1.15am! Can't wait and hope we enjoy it as much as ye did. Enjoy your traveling and we may bump into ye along the way!